a surprising and previously unknown fact that has been disclosed to others. the divine or supernatural disclosure to humans of something relating to human existence. I shall choose Gulzar for me as the latter meaning as calling the wok of Gulzar Saab, is divine. Calling it anything else would be a sin. I recently bought a set of Gulzar Saab’s poetry and promptly gifted it to my sister as I had no interest whatsoever in reading Hindi Poetry, However beautiful it was. But the book had something else in store for me, see the book had an interesting format. The book put down Gulzar Saab’s poetry as one side in Hindi and the other as English. And that, isn’t something I can ignore. I just started going through random pages on the books and one by one it drew me in till I fell in love. The mere title drew me in. We all thought of Pluto the planet but whoever thought of naming a collection of poetry after the fact that its importance has been diminished? I sure didn’t. So, the books, I am still going through, but that just prompted me to fall further into the whole Gulzar Train of thoughts, and what do I find!? 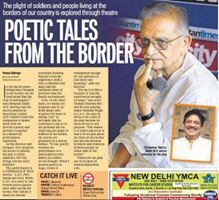 Lakeerein, Gulzar‘s collection of stories and poems “Lakeerein”, encircling the journey of last 60 years of Indo-Pak relations, was brought to life on stage for the first time in the form of a play. And it was going to be lie here in Ahmedabad. Who would be so foolish as to miss it? The experience in a word was Ethereal. It was straight out of this world. The show is a tribute to the resilience of the human spirit and of shared values nurtured over centuries of common co-existence. In films like ‘Border ’ and ‘Mission Kashmir ’, Pakistan is the jaani dushman and we might damn these films for their jingoism. Popular Hindi films are known for their black and white worldview; one can almost be blasé about them but of what plays like LAKEEREIN? The Partition in the mindscape of these plays represents the great danger of being the other extreme of simplistic Hindi film plots. turning in nuanced performances. Lubna Salim’s narration is strong and full of conviction. The cast was beautifully chosen, all perfect for their roles given. 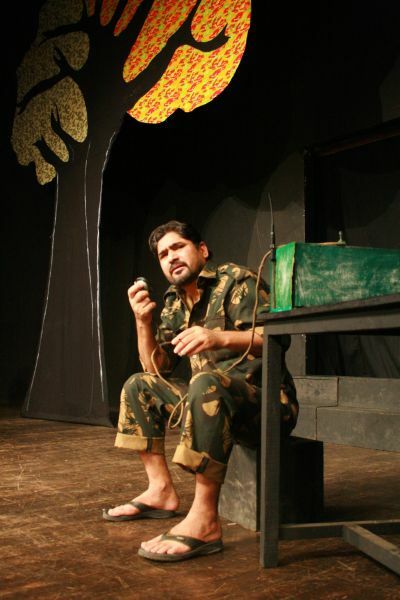 The play consist of Gulzar Saab in his core element. Simple words put beautifully to bring out a whole new perspective. I spent half the play furiously noting down as much as I can, till i realised I was missing the actual play while trying to document it. There I was, falling prey to the cons of my generation, again. But here are the few lines I did manage to note down. Batwara is the story of a man who believes that the writer is his long lost son in the journey across the border, someone who was destined to be discovered and reunite. The relationship acquires poignancy with passage of time leaving a lasting impression. Peer Saheb is about the presence of a Peer in the life of another writer, someone who oversaw the passage of this family in turbulent times. L.O.C. is a telling comment on the partition of people across the border, with common roots and culture. Over deals with the life across our porous borders, about soldiers and infiltrators leading a life that is very different than the frontlines of newspapers suggest. Lakeerein rengti hai; inhe roko; inhe roko. This was my first experience with a Hindi play what what an introduction! It left me feeling that sheer joy you get, when you read a book that touches your soul or a song that speaks to you in ways no human being can; thats how the play spoke to me. In HIndi at that! I was more surprised than anyone else I enjoyed it so much but then as JK Rowling says, “Words are, in my not-so-humble opinion, our most inexhaustible source of magic. Capable of both inflicting injury, and remedying it.” Gulzar Saab’s words did both; inflicted pain of the relations gone awry in the hands of a government they can’t do anything about; and for me, remedied the pain of the day to day mundane. If you get a chance to catch the play anywhere, do give it a shot. Previous Post Mental Disorders : Read and Learn. Next Post Slash and Kennedy performed in India : AND I WAS THERE!